* Air mail postage is included for international subscriptions. A student subscription rate of $30 is available only to SNATS members in the United States, and will be sent in bulk to the SNATS advisor. For more information, contact your local SNATS advisor. 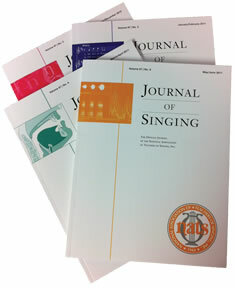 *All Journal of Singing subscriptions must be prepaid by credit card or check drawn in U.S. funds on a U.S. bank. Individual rates do not apply to subscriptions paid by an institution. All claims for any missing issues must be made within 60 days after publication date of issue claimed. Issues older than 12 months are available for purchase only in digital format. To access these files, search the Journal of Singing Index.